With ‘Romantic Background Music V2’, we seduce you with six tracks of pure stimulation that span the musical genres of ambient, Rnb, funk and acoustic. We deliver this intoxicating music pack straight to your ears as an instant download that you can access immediately after purchase. 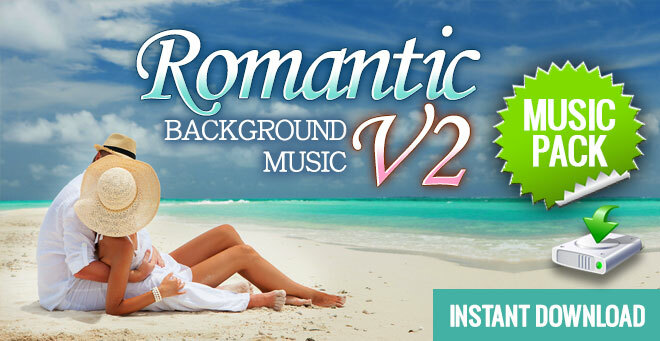 ‘Romantic Background Music V2’ is the perfect partner to our first ‘Romantic Background Music V1’ Music pack, which also features six flirtatious tracks, guaranteed to elevate the heart rate and arouse a sense of exhilaration. When you need a sound track that really hits the spot, ‘Romantic Background Music V2’ will get you there. Download ‘Romantic Background Music V2’ right now and become enamored with Q-Music. You know you want to.